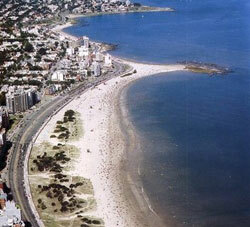 Malvín was previously a beach resort town because of its two popular beaches, Playa Malvín and Playa Honda. Recent years, however, saw the town being transformed into a residential area with one of the higher qualities of living in the country. Places of interest include the sporting and social complex Club Malvín and the tiny Isla de las Gaviotas in the South Atlantic Ocean off the coast of Malvín. It is an ecological reserve that is home to several bird species, especially gulls.